The constantly changing roster of rock ‘n’ roll artists over the years all but ensures there will be those who passed through the ranks completely unnoticed. Small underfunded labels had scores of releases which never got so much as a mention in any national publication, never adorned the playlists on any radio broadcast and often were not even shipped outside of whatever small regionally based distributors the company used. Breaking out of that cycle of anonymity with all of the odds stacked against them was a struggle that all too few could pull off. Thus the artist who in the big scheme of things had indeed succeeded in the sense of making a record, instead found that small measure of success was altogether insignificant when you really got down to just what it takes to make a lasting career out of music, never mind ascending to the level of a true star. Rock history is overflowing with those names, obscure at the time and forgotten ever since. But those records were what sustained rock ‘n’ roll in many ways. The constant influx of new artists with the same old dreams entering the fray, hoping to emerge on the other side and take their place among the elite is what ensured that rock wasn’t going to die out. Their records may not be special but their hopes that they might be were. History generally isn’t kind to those artists, preferring instead to endlessly celebrate the icons, but every record isn’t Johnny B. Goode and it’s those other kids sitting beneath the trees by the railroad tracks strumming their guitars who DIDN’T see their name in lights in the end which provides the fuel which propels rock’s endless cycle of dreams. Most of those kids if they ever got as far as a studio to cut a session wound up with records which were modest in their aims and even more modest in their abilities, their obscurity justified by the results. But every so often one of those artists who awoke to find those dreams dashed was somebody who had it in them to take their place on that big stage – at least for a little while – and compete with the stars. When you stumble across one of them unexpectedly while perusing the endless parade of also-rans rock offered up you can’t help but smile. These unlikely and unheralded efforts serve as a constant reminder that it never hurts to go back and see what people somehow missed out on. All The Hep Cats Too! Chances are – at least if you’ve been immersing yourself in the records we’ve reviewed to date – you’ve heard Lonnie Lyons even if you weren’t at all aware that you were listening to him. Lyons was the pianist in the house band of Freedom Records in Houston in the late 1940’s and early 1950’s. It was a label that didn’t last long and didn’t make much noise commercially while it was around but as relative failures go Freedom Records was rife with talented figures who churned out some truly impressive work along the way. Most of this was courtesy of their loose knit studio band which ostensibly was under the direction of saxophonist Conrad Johnson, yet he was hardly the focal point of the music, not when the label’s top featured artist, Goree Carter, was also playing guitar for the band… the same crew called The Hep Cats on his incendiary Rock Awhile from last month… and, as we see on Flychick Bounce, when Lonnie Lyons also got a chance to step out front of this outfit the results hardly suffered. These were the prominent figures shaping the music emanating from Houston, Texas at the time – deep rhythm sections featuring blistering embellishments from Carter and Lyons and the horn players and topped by an aggressive attitude that was well ahead of the curve when it came to the direction rock was heading. Carter we know about. Though an artist with no national presence at the time, or even in the next half century that followed when rock history started to be written in earnest, he’s rapidly gained notice in the two decades of the Twenty-first century once his ahead of its time output (its modern re-appraisal helped greatly by rock historians unbalanced obsession with guitars) has been rediscovered, heavily promoted and more widely embraced. Lyons though has had no such bump in notoriety in recent years. He’s lacking the influential aspect of bringing something new to his instrument of choice, which itself would diminish in popularity within rock ‘n’ roll over time, and the records he was credited as leading failed to draw even the modicum of minor interest Carter’s had back in the day. In every other way however Lonnie Lyons emerges now, in 2018, as a strong candidate for rediscovery. There have been a lot of loose jam sessions put to wax thus far in rock ‘n’ roll, all with the same basic intent. Get a rolling groove going, let it simmer for awhile while tossing in some verbal encouragement along the way to keep it heading in the right direction. The formula itself is rather simple of course but as with anything it’s the methods they use to achieve their goals which will decide its ultimate fate. At worst the results are formulaic, adhering to a strict by-the-numbers approach which lack enough heat to get the pot boiling. But in the best of circumstances the same ingredients with the right spices added results in a completely fresh, original dish. The difference between the bland and the sizzling in this case come down to the Hep Cats and one helluva title in Flychick Bounce to go with it. It’s Lyons piano which kicks this off in assertive fashion, pounding out a rhythmic boogie that immediately gets picked up on by Johnson’s sax taking a seductive early solo on the extended intro which lasts nearly 40 seconds leading you to believe this is an instrumental. That wouldn’t necessarily be a bad thing either as the intensity of Lyons playing increases as it goes along and Johnson’s work on alto, not the usual centerpiece of a tenor, is very complimentary, adding to the allure. When the lyrics come along announcing the invitation to the “fly chicks and hep cats” however the song takes on an added dimension which pulls in all but the most recalcitrant of listeners. There’s not many lyrics beyond that really, just brief exhortations that pop up every so often, but the effect they have when they do appear is galvanizing, adding color and clarity to the scene unfolding in your mind. You’re transported to the scene of the party, you can smell the barbecue and taste the beer as you listen. Your feet start moving, your shoulders begin grooving and without even needing to close your eyes you are there. The song itself becomes the living breathing atmosphere to something larger. More than a record, it’s a memory to a night you never actually experienced – not the one they’re all enjoying anyway – but one you recognize at a glance because you’ve been to others just like it. As it struts along we see all of the characters off to the side start coming into focus. Carter makes his presence known halfway through with one of the more idiosyncratic guitar solos you’ll find. Sounding nothing like his over-amped workout on Rock Awhile, here Carter delivers Cheshire Cat-like lines which appear out of the smoky haze then suddenly disappear from your consciousness. Their tone itself is elusive, more of an apparition than a tangible sound and when you turn around to try and discover its source all that remains is the faint echo. Those at Freedom Records had to recognize Carter’s genius, it’d be almost impossible not to and their signing and promoting him as a solo artist indicates they knew their fortunes as a label, at least at this stage, would rest on his output. Yet here they wisely don’t force him to center stage, allowing him to remain a sideman, just one aspect of a bigger ensemble. He’s not dominating the record, or even setting the mood, but rather he’s merely adding to the ambiance. The construction of the tune is turned somewhat inside out. Normally the meat of songs are found with the verses and particularly a hook-filled chorus, with the instrumental passages acting more like condiments on the sandwich. Not so with Flychick Bounce where it’s the musical riffs which sells this as the lyrics act merely as the transition points where the song shifts from one addicting facet to another. Lyons the singer therefore isn’t meant to do more than act as a de facto off-screen narrator, his nasally almost unmelodic voice sounding as if his head were submerged in a bucket of water, yet somehow that doesn’t detract from the performance which was never meant to be anything more than a jumping off point for the next solo. That’s where Lyons gets his real chance to shine, hammering away on the keys, the pace unrelenting and with a buoyant yet gritty feeling. This reeks of the kind of place where outsiders would feel a little uneasy, yet those who’ve been immersed in the neighborhood for years know every face, every darkened corner of every room, and feel right at home. Before you get the wrong idea there’s nothing menacing about the record, it’s far too upbeat for that, this is a party after all, and yet there’s a sense of subtle tension embedded into the grooves, heightened by the anticipatory tone of the saxophone which suggests anything may happen at any time. All of the musicians mesh with uncanny precision, frequently sounding on the verge of disorderly conduct yet holding together and confidently barreling forward without any doubt as to their destination. 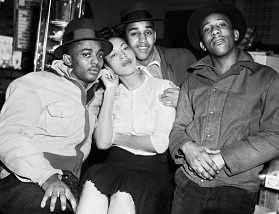 You wonder if history would think differently of these guys – or think of them at all rather – had ALL of the records they played on together been released under the Hep Cats name. There were no self-contained bands in rock at this time, not the way we came to think of them down the road, but these guys qualify under any other parameters, playing together in the studio and presumably in clubs around Houston, for a solid two or three year stretch. On Carter’s records he got the artist designation, which was entirely justified, with the band given The Hep Cats name probably just because it sounded cool and might entice a curious browser in the record store to pick it up. But what if they had been billed as a full-fledged cohesive band on everything they cut together? Carter would clearly remain the leader, the best songwriter, singer and instrumentalist, but you’d have Lyons able to chip in on a few vocals, maybe one of the other cats could sing a few as well. Might they have been The Rolling Stones before The Rolling Stones, or been the precursor for Sly & The Family Stone? The possibilities are limitless. Whatever name they were using, or using no name at all as the case was, there can be no doubt that this group of Texas hot-shots could flat-out kick it. 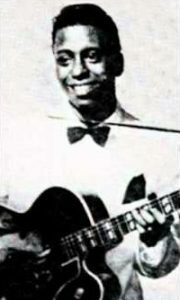 In another era with different goals on the part of musicians, record companies and the public itself, the names of Lonnie Lyons, Goree Carter and Conrad Johnson, along with Nelson Mills (trumpet), Sam Williams (tenor), Nunu Pitts (bass) and Allison Tucker (drums), would’ve been well known if not revered in rock circles. As it was they were all but anonymous to everyone outside their family and friends… and now, nearly seventy years later, you can add a handful of lunatics reading this to the ledger of those who might have a glimmer of recognition when it comes to their legacy. The reasons for the failure of Flychick Bounce to make an impression at the time are obvious. A small label with limited distribution, promotion or experience trying to divide their assets – that would be these musicians – into as many different entities as they could so as to have multiple artists to release singles on, meant that there was little chance for any one of them to gain notice, let alone all of them. That Goree Carter, who takes a back seat to no one we’ve met so far in terms of potential, couldn’t break out onto the national stage tells you all you need to know about the travails all rock artists at the time faced. But what is so striking is the sense that they all had it in them to be stars, collectively if not individually, or at the very least be comfortable in the orbit of the stars of that era. No, this record itself, as much fun as it is, wasn’t a game changer in of itself. But it wasn’t designed to be. What it WAS in the final analysis was an embodiment of the entire lively spirit of rock ‘n’ roll as played by a bunch of kids with nothing to lose at a stage of their lives when all of the promise of tomorrow seemed within reach and none of life’s crushing realities seemed remotely possible, let alone imminent. But of course that unrelenting optimistic confidence is the allure of youth and the allure of rock ‘n’ roll as the embodiment of youth and consequently why rock over the years has been able to remain so vital, because it constantly taps into that and reimagines it for each successive generation. In relatively short order the hopes and dreams these artists shared would fail to come to fruition. The hits which seemed so certain when they were just starting out would never materialize, the band would drift apart, Goree Carter would wind up drafted into the Armed Forces, Freedom Records would shut down, Lonnie Lyons, the centerpiece of Flychick Bounce and the anchor of the Hep Cats studio band would die at the age of 26 in 1953. In the years since it’s doubtful Lonnie Lyons’ name was ever spoken in reverence by any assemblage of rock fans. Likely it was never even known. But in an alternate universe where musical justice prevails Lyons is leading the band tonight, the drinks are flowing, the room is heating up with writhing bodies on the floor and the doors are wide open at the place where all the fly chicks… and all the Hep Cats… can still be found. I read that title and thought, “Well, this’ll be silly.” For some reason, I didn’t expect “Rock Awhile, Pt.2.” The Hep Cats are definitely the focal point here. In particular, Lyons’ skills on the ivory keys are rightfully highlighted. In fact, I prefer Lyons’ technique to his label-mate’s, Little Willie Littlefield, who has mostly come off as all speed, little substance thus far (that could change, I hope). Though the lyrics generally aren’t stellar, I do love the line, “Well, they ball all night just to ease their troubled minds.” I feel like another song could’ve really ran with that line and its sentiment. Overall, an “8” seems like a good rating for this well-played, raw rocker. Leave a reply on "Lonnie Lyons: “Flychick Bounce”"